Her desire to heal her soul lead her to dance. She became a professional dancer (Rotterdam’s Dansacademie, Holland; Cunningham Studio, NYC, Trisha Brown Co). In 1987 she completed her Professional Feldenkrais Training, which changed her understanding of Self, Body, Movement and Dance forever. She is a Choreographer who created evening length dance pieces often with the theme of raising consciousness about the sacredness of Mother Earth and the body. After working with Emily Conrad the founder of Continuum Movement and Susan Harper for many years she created Wave-Continuum. WaCo is a beautiful movement practice that opens the heart and connects the dancer to the deep wisdom of life embedded in our cells and the universe. Living in Honolulu Eva holds Conscious Dance Events called Hearbeat Dance as well as teaching dance technique, Contact Improvisation, WaCo and Feldenkrais. 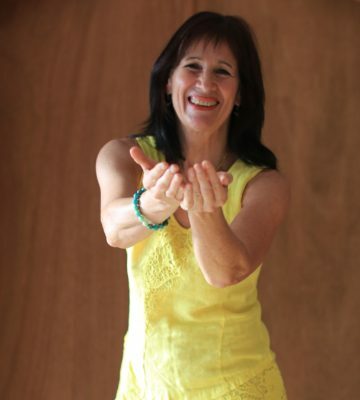 Since she moved to Hawaii in 2000 she studies Hula and the true meaning of Aloha! She is a sun dancer and fire keeper in the Native American tradition. Learning awareness of the body and self will translate into Awareness for others and the surroundings as well as the virtues of peacefulness, self-love, compassion, gentleness and non-violence. Thus Eva Alewa stresses the loving conscious use of the body and the end of fighting against it as a practice of peace.